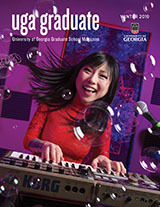 The mission of Disability Resource Center (DRC) is to create an accessible academic, social, and physical environment for students with disabilities at the University of Georgia. It seeks to eliminate altitudinal barriers that exist on campus and serve as an advocate for students with disabilities in accordance with the Americans with Disabilities Act of 1990 and Section 504 of the Rehabilitation Act of 1973. The DRC provides services to students who have either a physical, cognitive or mental impairment (e.g., a chronic illness, attention deficit hyperactivity disorder, learning disability, hearing impairment, visual impairment, mobility impairment, psychological disorder, acquired brain injury) which substantially limits one or more major life activities. It also encourages students to develop indpendence and responsibility as they partricipate in university life. The DRC provides a variety of academic and support services to promote equal access to university programs and activities. It also provides assistive devices and state-of-the-art adaptive computer equipment specifically designed for people with disabilities. To qualify for services, students need to complete an intake packet and provide current documentation supporting their disability from a qualified health professional. For more information on eligibility and services, please call 706-542-8719 (voice) or 706-542-8778 (TTY).